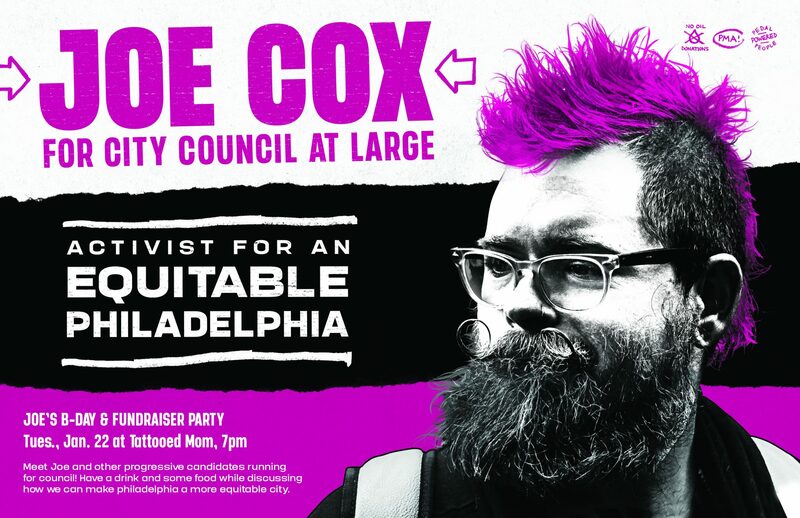 2019 is here and Philadelphians have the chance to help elect a brand new city council, so come meet & mingle with Joe Cox at this TMOMs fundraiser and learn more about about their campaign for City Council At-Large! This event will also feature other fantastic progressive candidates running for office and local activists who are supporting Joe’s campaign to create a more equitable Philadelphia! Guests & speaker list to follow! This road is going to be long and difficult; we can’t do it without you! Please note that this event is 21+ w/ valid ID. The proceeds from this event will go towards building the Joe Cox campaign infrastructure, which is vital for their political visibility & success. A portion of the bar proceeds will also go directly towards the campaign! Online: Please use the campaign’s secured donation website via CrowdPac. Join the Facebook Event & invite all your pals!